As the days start getting longer, the cool wintery chill begins to thaw, and a sense of hopefulness permeates through the air, it means one thing, it’s time for spring, and time for cherry blossom season! Throughout the centuries, Japan has celebrated the arrival of cherry blossoms through a variety of art forms, from ceramics to kimono to lacquerware, and everything in between. In celebration of the arrival of spring and the diverse representation of cherry blossoms in Japanese art, here are some of our favorite cherry blossom arts and crafts. 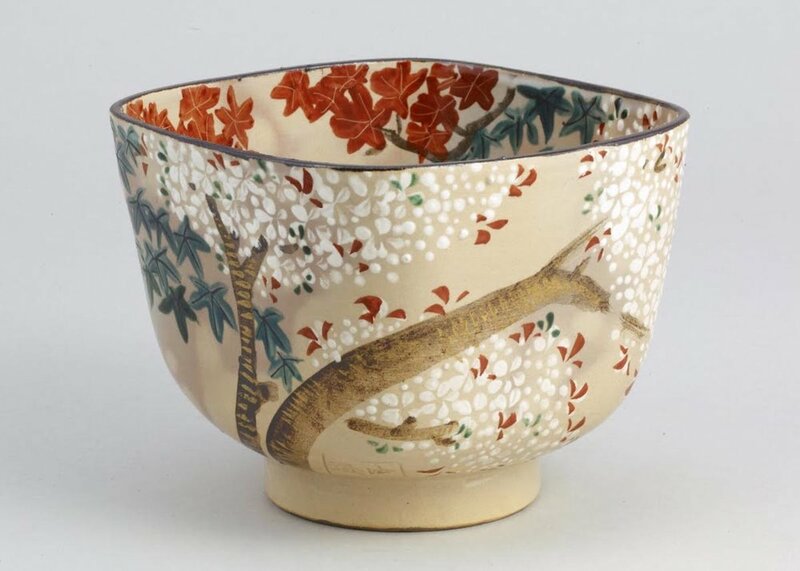 Crafted by renowned Japanese ceramicist, Ninami Dohhachi (1783-1855), this 19th-century piece is an excellent example of the artist’s ability to turn everyday objects into delicate pieces of art. After spending his early career working in Awata, in 1842, he set up a kiln in Fushimi, near Kyoto, he became one of the leading figures in the world of Kyo-yaki. The soft white cherry blossoms, seen here dancing in harmony with the contrasting red maple leaves (known as momiji) was one of the ceramicists’ most iconic motifs. It’s a celebration of Japan’s most famous flowers and the hopeful and temperate season in which they appear, if only for a brief moment. 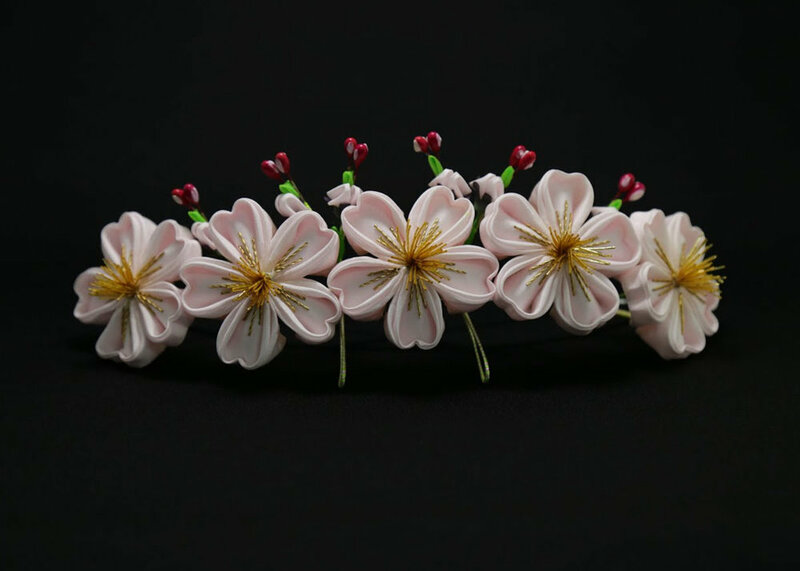 Hanakanzashi are both practical and delicate floral-themed hair decorations, worn by Japanese maiko - geisha in training - and also worthy pieces of art in themselves. Worn on a monthly rotation, maiko typically have 13 hanakanzashi in their possession, one for each month and a separate one to be worn during the Gion Festival. This sakura artwork from Kyoto kanzashi store Kintakedo (see map) is an excellent example of a spring piece, which would be worn in April. With its soft pink flowers, golden and green finishes, it’s sure to turn heads. This robe has all of the hallmarks of an iconically Japanese garment, with its soft cherry blossoms, proud traditional chrysanthemums, and repeated peony motifs. Kosode were worn by both men and women throughout history, depending on the colors and design used. The rhythmic patterns of rippling gauze weave on this kimono are overlaid with pale turquoise, dye which sets off a fresh, summery, water-centric aesthetic. Adding a layer of texture to the piece, the flowers are embroidered using vibrantly colored thread, while a stencil dyeing technique was used to create the delicate finishes. It’s not certain when, but historians believe the piece was crafted sometime in the late 18th or early 19th century. A figure famous for his more realistic take on ukiyo-e style painting, Sakai Hoitsu’s (1761 – 1828) work is as historically significant as it is aesthetically stunning. Mainly based in Kyoto, he spent much of his career working to revive the art of Ogata Korin, an artist whose work he reproduced on multiple occasions. Although much of his career was defined by his recreations of Korin’s work, this piece - created in 1805 - is an excellent example of Hoitsu’s individualistic thinking. The painting was crafted from six-panel folding screens; ink, and shiny gold leaf on paper and features a cherry blossom tree painting in a way we don’t typically see in Japanese art. While the trees are a common subject, rarely do they feature entirely solo in this way. This commanding piece was crafted sometime between 1670-90 and is typical of the bold, glossy art of Nabeshima ware. 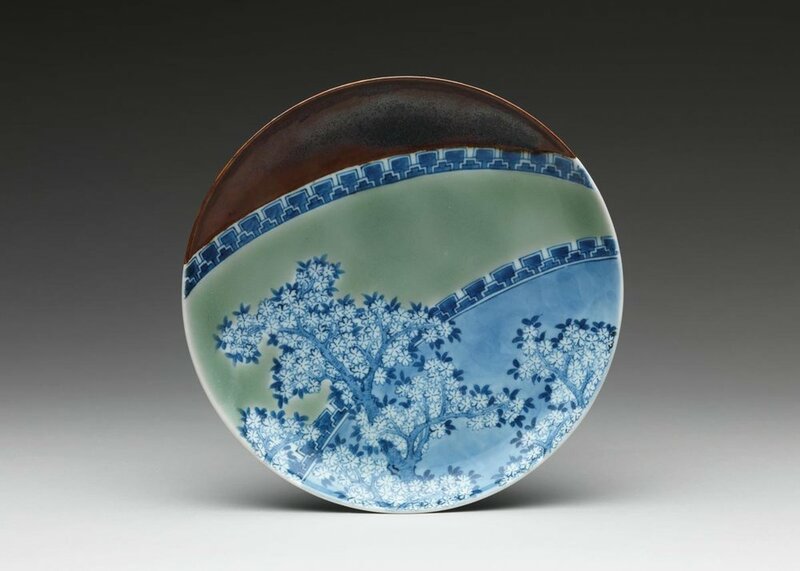 This style of Japanese ceramics is characterized by its more traditional themes and bright cobalt and aqua blues. The puffs of iconic sakura flowers have been created using a technique known as underglazing where the images are painted on the ceramics before being coated in a clear gaze and then fired in a kiln. Enthralling in its moonlit moodiness, this woodblock print is a more modern representation of cherry blossoms in full bloom, but nonetheless, it’s a notable piece of classic Japanese art. Created in 1920 by painter Hiroshi Yoshida (1876 - 1950), it’s a recreation of a watercolor piece the artist first painted in 1904. As a student, Yoshida studied Western-style art while in Japan, but through the patronage of American art collector and industrialist and Charles L. Freer, Yoshida was able to travel the world, drawing influence from all the diverse nations he visited. What makes this print particularly unique is the western style of exploring a traditional Japanese motif, the cherry-blossom-dotted mountains of Yoshino. An interesting extra fact worth noting is that the women in the piece were the daughters of Yoshida’s fellow artist Kawai Shinto. Take a look at our 12 Must-See Japanese Masterpieces for more cherry blossom art! Crafted sometime in the late 16th–early 17th century, coffers of this time were often made for export. This is why perhaps the creator of this piece decided to decorate it with the exotic animals rather than local Japanese animals, as a way to appeal to the foreign market. Created using lacquered wood, these nanban coffers were designed as a hybrid between western and Japanese style design, a way for Japanese craftsmen to try to appeal to the foreign market, but also undeniably influenced by their surroundings. On this example, panels run along the front and on the lid of the chest depicting a series of vibrant scenes including peacocks, tigers hiding in bamboo, all surrounded by iconically Japanese foliage including the beautiful cherry blossom. You can see more Examples of Japanese Wood Art in our article here. 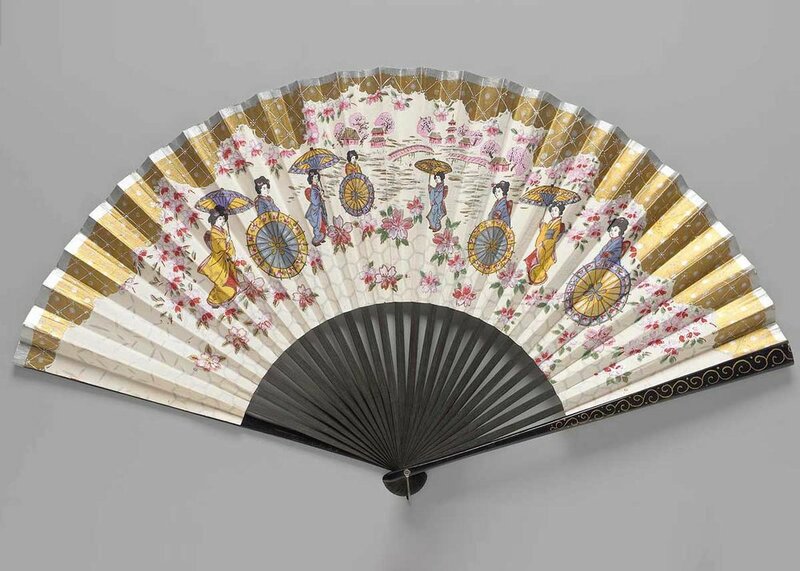 It’s no secret that we here at Japan Objects are big fans of the art of the folding fan (check out our article here to learn more about them). Made from white paper leaf and emblazoned in vibrant blocks of color; purple, gold and the unmistakable pink of the cherry blossom, this is an excellent example of mid-20th century Japanese craft. In terms of materials, this piece is ultra simple consisting of just paper, paint, lacquered and painted wood; and a metal ring holding it all together. Noh theater is one of the most integral forms of Japanese performing arts. Performed since the 14th-century, all facets of the form, from the stories to the costumes have influenced Japanese art. An atsuita is a robe familiar to Noh theater actors, a kimono-style garment worn by male performers. The design of this specific piece, crafted sometime in the 19th-century is notable in the way it manages to balance the soft cherry blossom flowers, with bold and proud shades of lush green, autumn reds, and royal gold. 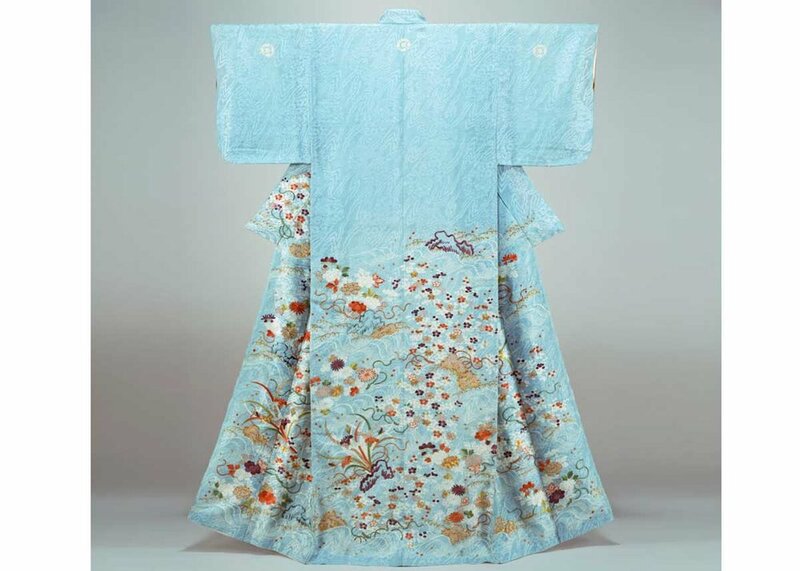 Typically atsuita like this were made from high-quality fabrics like silk, and utilized vibrant motifs, like crisscrossing lines and patterns to set off an air of power and command. One part of a collection of gifts (known as a trousseau) given to a bride in preparation for marriage, this delicate box was crafted from gold sprinkled on lacquer, an art form known as maki-e. Developed in the Muromachi period (1336–1573), the technique of maki-e varies from artists to artist, with some people using different metal powders like gold, silver, copper, brass, lead, aluminum, platinum, to create different textures. Made in the 19th century, it’s assumed that the piece was commissioned by the Shimazu family, who were once lords of Satsuma in Kyushu. Most likely the piece was commissioned for Princess Taka-hime around 1830. Regal, but delicate ornamental fittings crafted to fit around the hilts of a Japanese sword, fuchi and kashira were as much pieces of art as they were practical accessories. To help you identify the difference, in this image, the fuchi is the piece with the bird, while the kashira is the piece covered in beautiful spring flowers. The cherry blossom was not uncommon as a decorative device for weapons and armor. The flower was admired by warriors, as it represented the brevity of life. A symbol of the fleetingness of everything they were a source of inspiration for men who had to be constantly prepared for death. Another stunning karaori (Noh kimono) this piece was created sometime during the Edo-Period, though the exact date is not entirely certain. Historians, however, have managed to calculate though that by the lack of metallic threads in the piece, in combination with its vibrant, comprehensive patterning it was made sometime during the eighteenth century. Like a Noh theater production itself, this garment tells a story detailing the transience of human life. The cherry blossoms and their fleeting existence are representative of our earthly existence.